The home page and your accounts should appear in a way that is fitting for you. The names of accounts, order in which they appear on the home page, order of account groups and names of account groups can be changed in Account Preferences to suit your needs. In the Settings tab, click Account Settings. 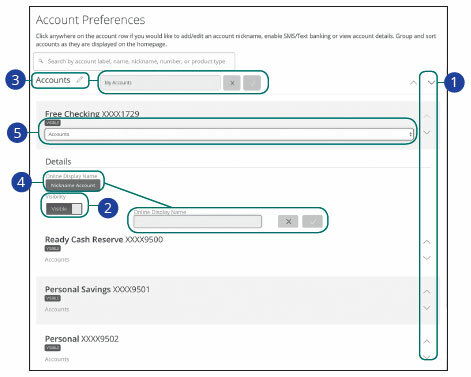 Select the up or down arrows on the right side to change the order your accounts appear in. Use the Visibility switch to toggle whether or not your account is visible on the Home page. Click the icon to change the nickname of a group or an account. Make your changes and click the check mark to save it. Click the "Nickname Account" button to change the online display name of an account. Make your changes and click the check mark to save it. Select the “Account” drop-down to change the group that account is in.